Order These Sign Supplies Before 1 p.m. EST And Have Them Shipped Out Today! These Innovative Sign Supplies With LED Lights Give You Advertising Impact At A Reasonable Price! 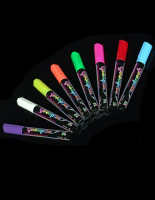 Features Thirteen Different LED Effects! 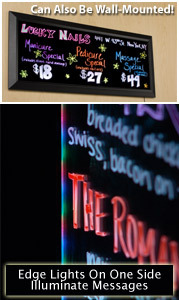 Common Size: 42" x 18"
LED illuminated message boards have 13 different flashing light settings at the push of a button! 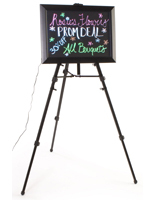 Includes (1) 42" x 18" sign, a height-adjustable easel, and set of 8 neon markers! Message boards are LED-illuminated for maximum style and minimal energy consumption! Black dry erase board and border for maximum color contrast. Menu signage, metal sign supplies for sale that are shipped with a cleaning fabric also incorporates a black frame & backer with small, concealed LED (light-emitting diode) lights on one inner edge of the display. Contingent upon taste, buyers can select one of thirteen varying light patterns. These can be adjusted immediately with the push of a button the side of the sign supplies display. The provided easel is height-adaptable to suit the LED frame in either portrait or landscape format. 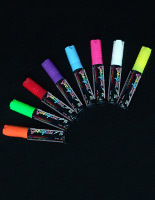 The set of eight (8) liquid chalk fluorescent marker pens are the ideal writing instrument for these sign supplies. 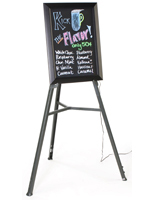 No matter if it's exhibiting menu specials, a sale, or even a clearance advertisement; this easel exhibit will clearly communicate your media content! Tools are also provided for wall-affixing and ceiling-suspension exhibit of the sign supplies. 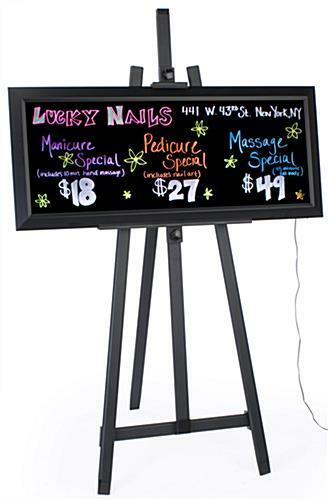 These sign supplies with marker pens and easel are a fantastic multitasking advertising display! This signage has the ideal dimension and form for writing out and exhibiting specialized menu products in a restaurant entryway. 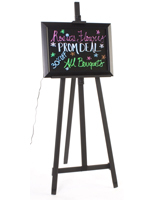 Sign supplies that flash, also recognized as easel markerboards, are excellent for lodging accommodations, commercial shops, banks, and more! These showcases enable sales owners to concoct tailor made signs, and modify it as often as needed! The flashing sign supplies for mounting signage communicate facts immediately and accurately to a goal audience! These fluorescent advertisers are fast becoming one of the most well-known various kinds of point-of-purchase publicizing! Please Note: These frames include hardware for wall-mounting in both portrait and landscape format. The suspension wire will only accommodate the sign in portrait format, however. Electrical Cord Length: Approximately 16 ft. Hanging Wire Length: Approximately 3 ft.
42.1" x 63.5" x 30.0"